Place peaches in a food processor; process until smooth. Add sugar, brown sugar, lemon juice, vanilla extract and salt; process until blended. In a large bowl, mix buttermilk and cream. 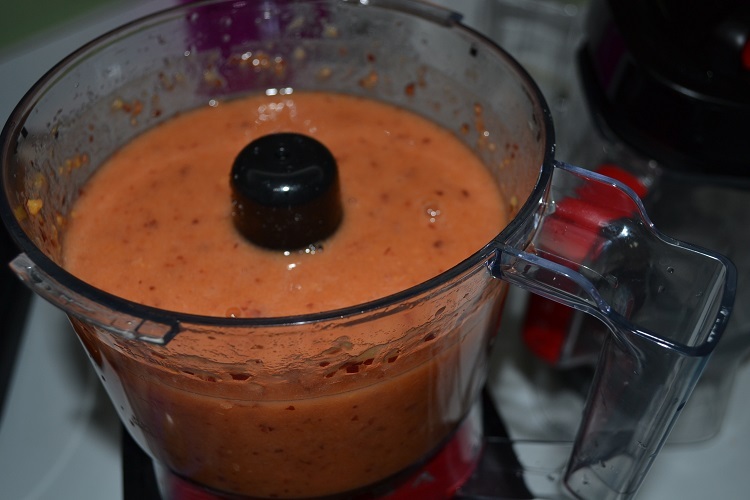 Stir in peach mixture. Refrigerate, covered, 1 hour or until cold. Fill cylinder of ice cream maker no more than 2/3 full. Freeze according to manufacter’s directions. 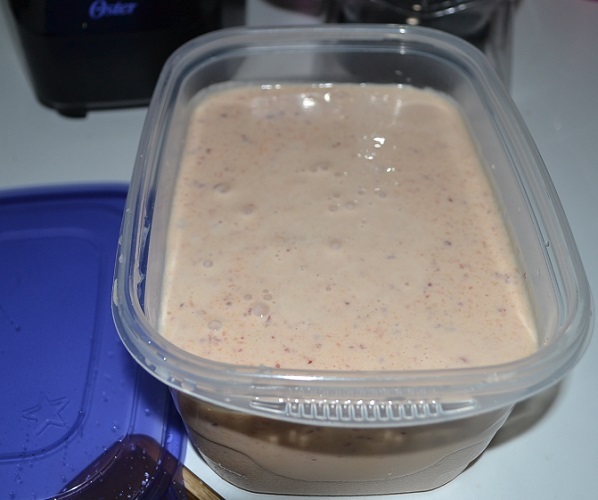 Refrigerate remaining mixture for later. Transfer ice cream to freezer container, allowing space for expansion. Freeze 2-4 hours or until firm. Let ice cream stand at room temperature 10 minutes before serving. I did not have an ice cream processor, so I’m not sure if mine turned out right or not. It turned out very hard, but it tastes good. It reminds me more of one of those Italian ice dessert things, because of how hard it is, but maybe I should follow the directions and let it stand 10 minutes before serving. Then my issue is that I won’t be eating it all in one serving, so do I refreeze it? Anyway, it’s worth a try if you like peach ice cream! If you just want to make juice popsicles, you simply pour your juices in the cups, add a stick, and freeze. I used grape juice, orange carrot juice, lemonade, and I tried mixing some of them. I also made some tricolored popsicles. First, puree some strawberries, lemonade, and sugar. Pour this mixture in the bottom of some Dixie cups, about a 1/3 full. Add a stick, and freeze for about 45 minutes. Take them out of the freezer and pour some vanilla yogurt over the strawberry until about 2/3 full, and put them back in the freezer for another 45 minutes. Next, puree blueberries, lemonade, and sugar and fill the cups with this mixture. Freeze again until frozen, and enjoy! I found a tip about freezing the popsicles: To make sure the sticks stands up straight, put some tin foil over the top of the cup and punch the popsicle stick through the center. The foil will help the stick stand up straight while it freezes. Prepare the brownie mix according to the directions. Spoon batter into a 9×13 pan. 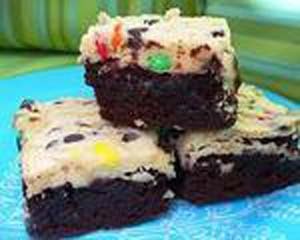 Cover batter with 1 c M&Ms. In another bowl beat cream cheese with sugar. Slowly add the heavy cream, eggs and vanilla. Blend until smooth. Evenly spoon the cream cheese over the brownie better. Bake 50-60 minutes or until toothpick comes out almost clean. Remove from oven and cool completely. Optional: before serving put whipped cream and a few M&Ms on top if wanted. This is another winner. I love making this for special events at work. Everyone always asks for the recipe. Got this recipe from my mom, but I’m not sure where she got it. 1. In a sauce pan melt butter. Stir in flour until smooth. Add 2 ½ c milk, bring to a boil. Cook and stir 1-2 min. or until thickened. Remove from heat. 2. Stir in 1 ½ c cheese, mustard, salt, and hot pepper sauce. 3. In a pan sauté the mushrooms, onions, carrots, and garlic in oil until tender. Stir in spinach. Cook and stir for 2 min. until spinach is wilted. Stir in cheese mixture. 4. Spread ½ cheese mixture in the bottom of a sprayed 9×13 baking pan. 5. Top with 3 noodles and half of vegetable mixture. Repeat noodles and veggies. 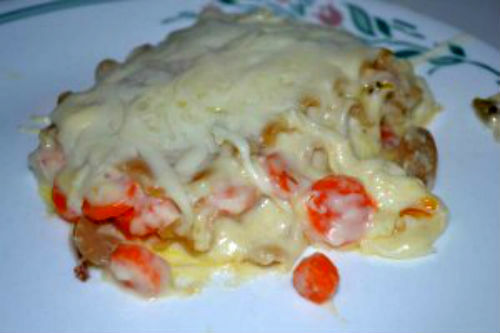 Top with noodles and cheese sauce. 6. Bake uncovered at 375 for 30 min. or until heated through. Let stand 10 min. before cutting. The only thing I would do differently next time is use less mustard. The taste of mustard was quite strong. 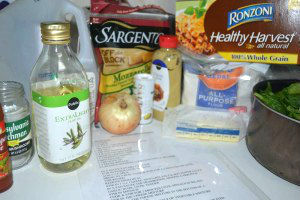 Let me know what you think of this recipe.